The Grays Harbor PUD’s collocation facilities feature controlled access, individually secured cabinets, video monitoring, redundant power systems, backup generation, and climate control. All of these facilities are monitored 24/7 for added security. Our colocation facilities are conveniently located throughout Grays Harbor County in Aberdeen, Hoquiam, Cosmopolis, Westport, Ocean Shores, Elma, and Montesano. 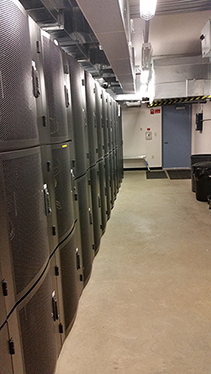 Colocation facilities feature flexible space options including full, half, one third, and rack unit cabinet space. Cabinet leases come standard with a 120V/20A AC Circuit. DC power circuits are available upon request. Wave Division Multiplexed circuits are available between many of the colocation facilities. Grays Harbor PUD also offers state of the art colocation facilities to private businesses enabling them to house equipment outside their own physical business locations. This allows us to provide businesses with a safe, secure, convenient location for off-site backup, disaster recovery and data storage. We also provide connections to our Service Providers in all of our facilities. For additional information see the Telecommunication Rate Schedule.